One of the easiest yet rewarding treks in the dragon kingdom. 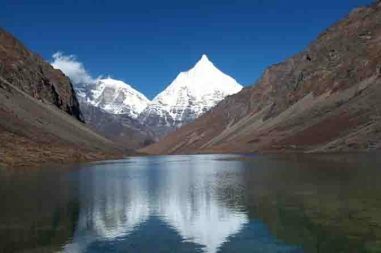 Gangtey Short Trek lets you experience the cultural and natural heritages . Its also known as mountain kingdom. This ten day long trek takes you from the major city of Bhutan to the more remote and isolated areas. These places are peaceful and calm. Bharal Adventure proposes this trekking for those who have less time. In this short time you can experience the magnificence of the Himalayan dragon nation in the limited time frame. The journey will start as soon as you land in Paro. From there you will drive to Thimphu for the night. You will be visiting the significant sites in Thimphu on the very day of your arrival. You will be taken to Punakha. Here a day will be spent exploring the rich cultural heritages of the country. You can add a white water rafting to your itinerary. 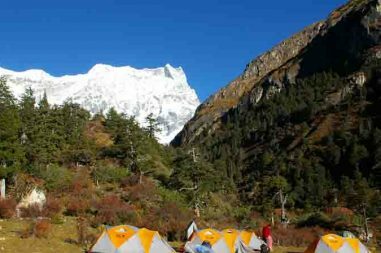 Gangtey Short Trek is unbelievably the most promising and diversified trekking trail of Bhutan. Witness the cultural and natural highlights of the dragon Kingdom. 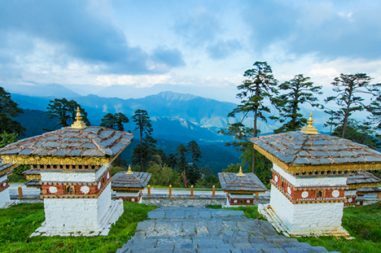 By exploring the mystical places of the Thimpu, Punakha and other villages of Bhutan. Paro offers the scintillating experience of observing the great craftsmanship of Bhutanese people. Gangtey Short Trek is an excellent opportunity to explore the rich cultural, natural and architectural heritages of Bhutan. It not only allows you to experience the sheer pleasure of spending your holidays in a Himalayan kingdom. Also It lets you catch the glimpse of some of the rarest birds in Bhutan. Bharal Adventure Pvt. Ltd. organizes the wide variety of the trekking and tour packages in Bhutan. You can relax and rest. We will handle all the hassles and logistics problems for the best experience of the dragon Kingdom. After breakfast, we go for a visit to the most beautiful fortress, Punakha Dzong which showcases the finest examples of arts and architecture of Bhutan. In the afternoon, we will go on a hike to Khamsum Yulay from the foot of the Dzong through old palace of the third king of Bhutan. The hike takes about three hours. If interested, a white river rafting could also be organized for the group. We will take a drive to valley of black necked cranes via Wangdue and on our way, we will make a stop to visit Rinchengang village. We will also be visiting Gangey Gonpa and to learn more about the endangered bird, we will take a visit to Black Necked Crane Center. The bird migrates from Tibetan plateau to Phobjikha every winter. In the evening, a visit to typical Bhutanese farm house shall be arranged if interested or you could also stay at farm house offered in Phobjikha. This day marks the start of our Gangtey trek. We follow the trail climbing through meadows and fields and then ascend to Tselela Pass from where we descend gradually down through the forests of juniper, bamboo, magnolia and rhododendrons until we arrive at our camp on the outskirts of Gogona village. We climb the trail going gently up above Gogona village and climb through the forests of fir, oak, spruce, rhododendron, cypress and juniper. A long and gradual climb will take us to Shobjula Pass from where we descend down to a wide valley of Khotokha, the summer settlement of people of Sha region of Wangduephodrang district. We ascend to Tashila Pass from Khotokha from the pass we then walk downhill through dense rhododendron, magnolias, ferns and dwarf bamboos forests. This stretch of trek is considered as one of the finest bird watching areas in Bhutan with the opportunity of catching the glimpse of rare birds such as Great Pied Horn Bill. We will stay the night at a hotel in Wangdue. We drive back to Paro via Dochula and Thimphu after breakfast. Upon our arrival in Paro, we will visit the National Museum of Bhutan and Paro Dzong during the afternoon. In the evening, we will explore the town and market area of Paro. 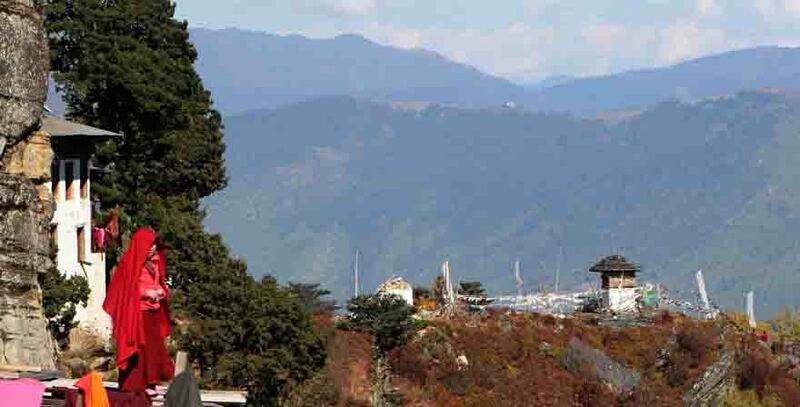 We will start the day with a visit to the National Museum which is housed in the Ta Dzong (watchtower) where we will observe the collection of artifacts that offers the information about the rich culture and heritage of Bhutan. A short walk downhill will take us to the Paro Dzong, however, if we have already visited these places the day earlier, we will move on to the exploration of other areas. Crossing a traditional cantilever bridge, Nyamai Zampa, we drive to the town where we can either visit a traditional farmhouse for lunch or have our lunch at the picnic spots available. We will then hike to one of the most revered monuments of Bhutan, the Takshang Gomba which is commonly referred to as the “Tiger’s Nest”. This four hour trek is rewarded with the picturesque views of the monastery perched on a cliff face at the height of 900m above the valley floor. On this day, you will be escorted to the airport by one of our representatives after bidding farewell to your trekking and tour crew members and friends.